Here's another trial cake, before I have to make wedding cakes in May. 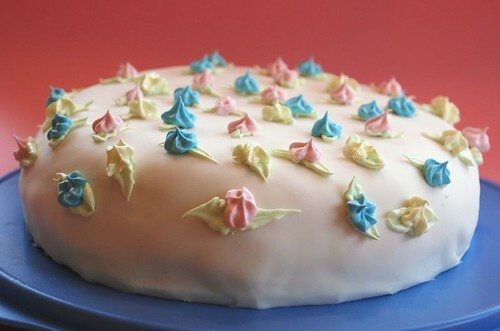 This is for an easter lunch with my sisters and brother, and it also doubles as a birthday cake for my niece Emmy who's turning 15 in a few days. Happy birthday Emmy! I haven't tasted it yet, but I can say that I am already sick of making the layers this way - individually. While it seemed like a great idea to not have to slice them, it's not as fun to fill each pan and make sure they don't become uneven. (As they undoubtedly will.) So, back to the drawing board on that - the good thing here is that they have no added fat, and are reasonably fluffy and moist. I would however like a stronger chocolate flavor. I filled this with chocolate mousse (a very slight variation on my normal true and tested recipe) and a raspberry jam that had been fortified with a few extra raspberries. (Frozen and thawed - no fresh in season now.) And finally, a raspberry buttercream from Rose Levy Berenbaum's great book that one of you faithful readers sent me, The Cake Bible. The buttercream is Rose's Neoclassic buttercream (1/2 recipe) and the reduced raspberry purée is a simplification of her more elaborate reipe, but it works well this way too. The whole thing is then covered in sugarpaste - or rolled fondant - and decorated with royal icing. Let's hope it tastes good, too! Definitely make this the day before when you want to serve it. The flavors will have more time to develop, and the chocolate mousse needs time to set. Decorate on the day of serving, though. This is also an entry for Easter Cake Bake, hosted by A Slice of Cherry Pie! You need three springform pans, 9 inch. Butter them and line each with a round of buttered parchment paper. Beat eggs and sugar until very fluffy. Sieve in the potato flour, cocoa powder and baking powder, and mix gently. Pour evenly into the three pans, and bake at 250°C for 4-5 minutes. Remove and let cool, preferrably on a rack. Mix together, and put on the first cake layer. Top with a second layer. Start by reducing the raspberry purée until half is left. Leave to cool completely. Beat the egg yolks until fluffy. Bring sugar and corn syrup to a boil, and immediately remove from heat. Pour over the egg yolks and beat at high speed until fully cooled. (Try not to get any on your beaters, or it will spin to the sides of your bowl. Add the butter, a pat at a time, until fully incorporated. Finally add the reduced raspberry purée, a little at a time. Spread this over the top and sides of the cake. Cover with plastic foil and leave in the fridge overnight. On the next day, cover with sugarpaste (rolled fondant) and decorate with royal icing. Mix and beat for 10 minutes with a kitchen-aid or handheld beaters. It's should be very thick and shiny. Color with food coloring if you want to, and decorate to your heart's delight. Oh my goodness, not only does that look delicious but it sounds it too - raspberry and chocolate, how fabulous! Thanks for entering. I saw raspberries from Spain for sale before & during the weekend, but I'm sorry now that I didn't buy any. Great job of decorating, Anne! Looks so soft and inviting and the inside sounds even better! Great combination - the berries and chcolate, one of my favroites. Thanks for sharing Anne! Make a shallow cut with a knife all around the cake at the place you like to part it. Then take a long piece of thin sewing thread, start at the side of the cake pointing away from you, placing the middle part of the thread in the cut. Then go on placing both ends of the thread in the cut until they meet at the side of the cake directly pointing at you. After this just cross the thread ends and pull them to the sides, going back to the imagined middle line of the cake.